In the long and detailed notes that founding member Robert Forster wrote to walk listeners through the first six years of The Go-Betweens’ existence, the singer/songwriter emphasizes his friend and creative partner Grant McLennan’s interest in cinema. It’s entirely fitting to stress, as listening to this impressive eight-disc collection (four LPs and four CDs) is akin to watching a montage of a young garage band learning how to play their instruments, play with one another and write songs as a group. Compare the rushed, ramshackle jangle of “I Wanna Be Today,” one of the earliest recorded songs by this Brisbane-born band, with the confident drive of “Man O’Sand To Girl O’Sea,” the final track on their third studio album Spring Hill Fair. It’s a tuneful “before and after” picture made somewhat stupefying when you keep in mind what little time elapsed between the two sessions (five years) and how much work they churned out between. G Stands For Go-Betweens is exhaustive in that way. There’s a wealth of archival material included on the four CDs: rough two-track sessions captured mere months after Forster and McLennan started the band in earnest, a live track from their brief sojourn to the UK and a full set from a 1982 gig in Sydney, radio sessions, and other stray tunes. Taken in one big chunk, you get a great overview of how this great pop band came to be. The strange alchemical reaction that allowed McLennan to evolve from a passable bassist to someone capable of writing a song as indelible and astonishing as “Cattle and Cane.” The outside influences and individuals that can help a group find its sound and direction. The friendly competition among bandmates and creative friction that can create sparks of brilliance and white hot conflagrations. All of that is available for your consumption here. The most fascinating aspect of this collection is how the artistic scales within the band tipped back and forth in these early days before they found the true balance that carried them through the six studio albums they made post-1984. Within this box set, it takes all eight discs to get to that point, but the moment-by-moment journey is a fascinating one marked with some remarkable pop songs. The earliest days of the Go-Betweens were almost entirely under Forster’s direction. With McLennan’s interest in music only stoked once he met his foil, he didn’t really start to let his songwriting acumen blossom until much later. 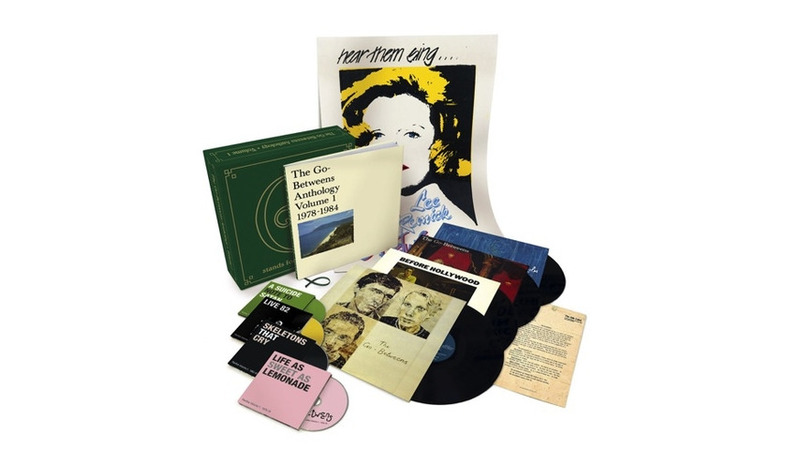 So, through the first few discs, particularly the first two CDs of rarities and the LP compiling the band’s earliest singles, you hear the audible imprint of Forster’s beloved ‘60s pop influences—the rueful “Long Lonely Day” is as much an Animals riff as it is a rough draft for the Go-Betweens’ later “You’ve Never Lived”; “I Wanna Be Today” is the hallucination brought on by imbibing early Pink Floyd singles—and the burgeoning indie sounds of the UK and their native Australia. Things got more interesting the more that McLennan starting asserting his voice in the mix (as well as the introduction of longtime drummer Lindy Morrison whose loose-limbed playing would help cement the group’s distinctive sound). His four songs on the Go-Betweens’ debut full-length Send Me A Lullaby helped balance the more agitated quality of Forster’s tunes. And he would quickly surpass his band mate by the time they entered the studio to record 1983’s Before Hollywood with mature and complex tracks like “Cattle and Cane” and “Two Steps Step Out.” If Forster’s contributions to that same LP are any indication—“Ask” and “By Chance” are as intense and smoldering as his gaze was in promotional photos—I have to believe that professional jealousy helped spur on much greater efforts on his part. Spring Hill Fair was the album were Forster and McLennan achieved parity at last. Both men contribute some incredible work to the LP, much of it expressing that weird combination of anger and wistfulness that often comes with a bad breakup (“Part Company,” “Slow Slow Music”) while also taking some time for some ruminative thoughts on the past (“Unkind & Unwise”) and future (“Five Words”). This was only the start of the richest period of the band’s history. It’s a shame that the set has to end there. Something else that comes into clearer focus as you work your way through this set should be just how important people inside and outside of the band were in helping The Go-Betweens reach such visionary heights. Key among them was, of course, Morrison who brought such inspired rhythm to everything the band did through 1988, and Robert Vickers, the bassist who joined the band between Hollywood and Spring, thus allowing McLennan to concentrate on guitar parts. But there are a dozen or more other figures that kept inspiring and aiding them: Edwyn Collins and Steven Daly of the Scottish pop group Orange Juice (the latter played drums on the early single “I Need Two Heads”), the folks at Rough Trade Records, and thoughtful producers like John Brand and Tony Cohen, among them. We should also take some time to admire the the lack of ego that Forster exhibits by allowing some of his less-than-stellar songwriter moments be mass-produced in this fashion. Because goodness knows there are early tunes on here that don’t hold up some 35 years later. Both he and the folks at Domino Records realize that even the missteps and pisstakes are important stepping stones in the process of the Go-Betweens becoming the Go-Betweens. No stone is left unturned here, and we should be very thankful for that thoroughness.